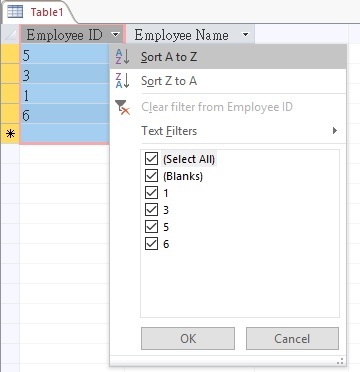 This Access tutorial explains how to add sorting in Access Table field. 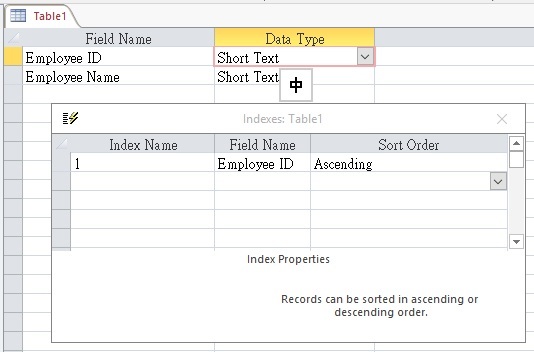 It is easy to add sorting in Access Query field in Query Design View (set in the “sort” row), but to add sorting in Access Table field is done differently. Let’s say we have the following employee table, where the Employee ID is not sorted. Although you can click on the arrow next the the filed header to sort the order, it does not change the underlying sorting in Access Table. If you create a Query and use this Table, the sorting will be gone. You also cannot save Table sorting which has Relationship with another Table. Select the Field Name and Sort Order. This action is actually adding an Index and not only sorting the field, so only Index can be sorted.